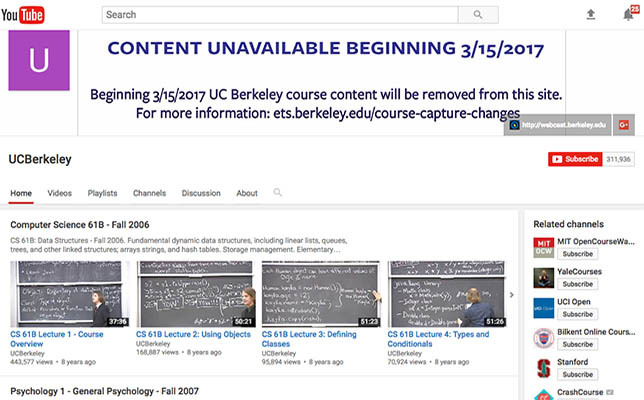 The University of California, Berkeley (UCB) last week informed its campus community that it would restrict access to its legacy Course Capture (classroom lecture) content from webcast.berkeley.edu, which includes more than 20,000 videos and audio files located on YouTube and iTunesU, as part of its ongoing effort to improve the accessibility of its online content. Beginning March 15, access to course content on iTunesU will be suspended and Education Technology Services (ETS) will move YouTube content to another channel that requires a CalNet/CAS authentication login. UCB Vice Chancellor for Undergraduate Education Cathy Koshland in an announcement said that the entire process will take about three to five months to complete. Koshland said the move addresses the United States Department of Justice’s order to make its “YouTube and iTunesU content meet higher accessibility standards as a condition of remaining publically available.” The department last August determined UCB’s free, online content was violating the Americans With Disabilities Act of 1990 due to a lack of captions and other accessibility issues. Koshland had issued a statement that the university “might not be able to continue to provide free content under the conditions laid out by the Department of Justice” and considered the removal of its online content from public access. ETS is working to provide CalNet users a new website that will function as a directory of recordings (expected to launch sometime in April on webcast.berkeley.edu). In the meantime, Koshland encourages all members of the campus community to visit the newly launched Berkeley Accessible Course Content website, which identifies best practices and techniques for creating accessible course content. Further information is available through the FAQ on the UCB site.